I have decided to make a new feature, every Thursday, where I find 3 of my favourite new items on the world wide web , and show them to you. This will mainly be fashion orientated, but sometimes I may throw a few surprises in too. So here we go. Here is my first Three For Thursday feature. Let me know what you think! 3 This gorgeous little playsuit is by Nom de Plum at Urban Outfitters and costs £65.00. It channels summer trend of all things nautical, yet is a brilliant piece for winter. Just wear with black opaques, and a chunky cardigan to be oh so chic this winter. Definately an investment piece as it can be worn all year round. Great for those who love vintage inspired garments. I WANT! Find it HERE. 2 My heart skipped a beat last night when my Cath Kidston newsletter graced my inbox, with this little beauty as the main image. I can’t resist! 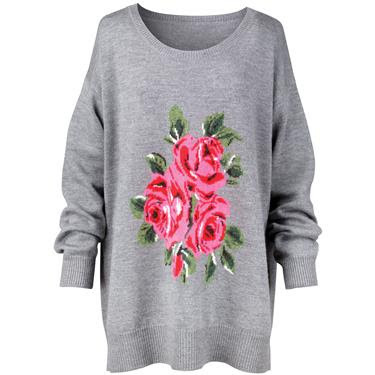 It looks so cosey and comfy and is perfect for those cold winter days. Wear it with some leggings for casual cool or black skinnies and grungy heeled ankle boots for a tougher edge. It costs £75.00, so again, a bit more of an investment than a splurge. Find it HERE. 1 Finally my favourite find of the week. 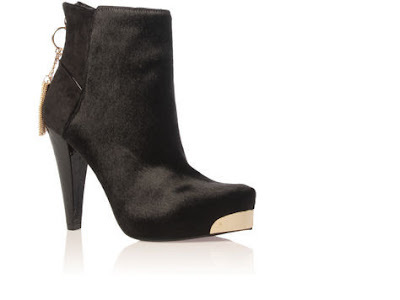 These GORGEOUS ankle boots from KG by Kurt Geiger. I am officially in love with them. I can’t work out what the fabric is, but it looks like a suede or a faux hair/fur. They also come in tan, which features leopard print at the front half of the shoe, but I think I’ll be sticking to these beauties. These ‘Soho’ boots come in at £200 a pair which is quite steep for little me with a student budget. Maybe Santa could bring me these instead? I hope so! Find them HERE. So there we have it. Those are the things that I am lusting after/ drooling over this week. Shame I can’t afford any of them! Check out my blog later today for pics from my shoot! "A Few Frames From The Customisation Shoot"